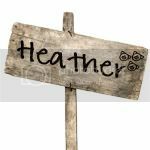 Farmer Fridays - The Real Farmwives of America - How did I get here? Welcome to a very special edition of Farmer Fridays. As I mentioned last week, once a quarter, the last Friday of each quarter, I am going to do a special feature within Farmer Fridays. Some of my farmer/farmwife buddies and I, The Real Farmwives of America, will address a particular question once a quarter about our lives on the family farm. ﻿I hope you will enjoy this addition to Farmer Fridays. So this quarter's questions is How Did I Get Here? Well, The Farmer is the 4th generation of his family to farm in our county and we are proud to be raising the 5th generation of future corn, soybean, and pig farmers. But how did I get here you may ask? Well here's my story. My parents both grew up on family farms. In fact, my mom grew up on a pig farm and my parents met while showing pigs at the county fair so my love of pigs and tractor driving days started early. Although I didn't grow up on a farm, I showed livestock, sheep, rabbits, pigs, and cattle, during my 10 years of 4-H and always lived in the country. I loved this life and it inspired me to major in Animal Sciences in college. During my time at Purdue University, I was very involved with the Animal Sciences department and spent a year on the livestock judging team. Luckily during my time at Purdue, I was also introduced to The Farmer by his cousin and after 10 years of marriage the rest is history. I am a proud farmer and farmwife so welcome to The Real Farmwives of America. 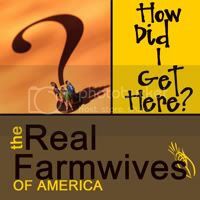 I hope you enjoy reading how my fellow farmwives ended up where they are. Amy at A Latte with Ott, A.
I have always worked full-time away from the farm even though my love and passion in our family farm. I have been in my current position for almost 3 years. It allows me to work from home when I am not traveling. Thankfully because of where we live in relationship to my territory, I don’t spend many nights away from home usually. I do have a lot of early mornings and a few late nights, but this allows me to maximize my time with my family which is huge. Although I traveled very little with my former job as I worked in an office setting, I truly feel that I spend more time with my kids then I did then as I was gone for several hours every day. Well due to some last minute meetings and a few other issues, my traveling is a little out of control for the next 6 weeks. Starting today, I will spend 2-4 nights away from home for the next 6 weeks which is resulting in some major mommy guilt for this mommy. It also makes me sad as I will miss the majority of the harvest season on the farm which is one of my favorite times of year. Besides the time away from my family, the other major bummer is I am flying on different airlines when I have to fly and I am staying in a different hotel chain almost every week which means no major gains in the frequent flyer miles or hotel points which could have been huge for a family get-a-way. Mommy guilt is not a fun thing and I know all moms suffer from it now and then. I can only hope that I am doing the right thing for my children at this time and in the future they will understand. So in the mean time, I will relish my weekends with them as thankfully I am home every weekend and will ask The Farmer to send me picture updates thanks to modern technology. It's been another crazy week around our family farm and today in particular was one busy, busy day. In addition to all of the normal chores around the farm, today we were cutting soybeans, applying organic fertilizer to the soybean fields as the soybeans were harvested for next year's corn crop, and we even had our monthly veterinarian herd check for all of our pigs today. That was just before 5pm and in addition to my full-time off-farm job and Bubby's soccer game tonight. My father-in-law has been gone all week so Bubby couldn't wait to ride in the combine with him this afternoon after spending the morning at Pre-K. Although we feed all of the corn we grow to our pigs, we sell all of our soybeans to a local soybean processing plant. Then we buy soybean meal, which is essentially ground up soybeans, from this plant to mix with our corn and other essential nutrients to make our pigs' feed. We use no-till conservation tillalge to plant our soybeans which is just one of the ways we are "green" on our family farm. Check out my friend, Ott,A's blog to learn more about no-till soybeans. She does a great job explaining it. Another way that we are "green" on our family farm is by recycling our pigs' manure. Our pigs our raised in climate controlled buildings that have deep concrete pits underneath them that store the manure. We then are able to take it out of the pits throughout the year and knife it into our field to use as an organic fertilizer which dramatically reduces if not eliminates our need to use man-made fertilizers. So today just as fast as my father-in-law was cutting soybeans, we were applying organic fertilizer into the ground so that we can plant corn in this field next year. Corn that will ultimately be fed to our pigs and allow us to produce more organic fertilizer. The pig truly is the ultimate recycler and an amazing example of the circle of life. If this wasn't enough excitement for one day, our veterinarian also came today for his monthly herd visit. Once a month he comes to check on all of our pigs for preventative care. I often joke that we take better care of our pigs than we do ourselves, but we truly do. I know that no one in our family goes to the doctor once a month for preventative care. The care of our pigs truly is our top priority on our family farm. And although my father-in-law and The Farmer are busy in the fields, Bubby is busy with his own fields as I am no longer allowed to walk on the carpet in my bedroom because it is a one of his fields. There truly is nothing better than growing up on a farm. Thanks for tuning in to this week's Farmer Fridays. 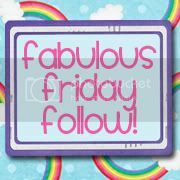 I hope you will continue to join you as we have some exciting happenings with Farmer Fridays in the coming weeks. The Real Farmwives of America are headed your way. Starting next week, I will be hosting a special quarterly feature the last Friday of each quarter within Farmer Fridays called The Real Farmwives of America so watch out Bravo and Dr. Phil, here we come. Additionally on the second Friday of every month starting October 8th, I will feature a guest blogger that will tell you about their family farm. 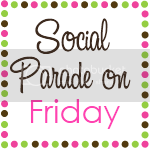 So stay tuned for lots of excitement with Farmer Fridays. Well it's been a crazy week which I know is nothing new at this pig pen, but it has also been eventful especially for Bubby. Bubby started Pre-K on Wednesday and I don't know where the time is going. It seems like just yesterday he was born and not almost 5 years ago. Although he was very excited to start school and appears to love it, he also was very excited to come home from school on Wednesday to find that we would be starting corn harvest before the end of the day. You see there's not much that ranks higher on this family farm than a combine ride with Daddy or Pop Pop. So not only did Bubby start school this week, but we also started corn harvest. The start of the fall season is always a very exciting time on our family farm and one of my favorite times of year. The field that surrounds our house was the first field planted this spring so it only made sense that it would be the first field harvested this fall. Although I'm excited that corn harvest has started, I really miss my privacy fence. If you remember, my house was surrounded by corn on 3 sides this year and the corn served as a very good privacy fence. Now that the corn has been harvested, it seems really odd to see our house from the road. In the coming weeks, I'll keep you posted on our harvest progress as well as the "mechanics" behind harvest.